If you’ve been following our videos on YouTube and LinkedIn, or generally keeping track of us via social media, you’ll know that we’ve set ourselves a unique challenge. We’re seeking to ensure that every exhibitor who signs up for the 2019 E3 Business Expo earns a clear return on investment BEFORE the start of the event itself. To put that another way, we’re going to be finding ways of ensuring that every exhibitor secures new sales worth at least the value of their exhibition fees before the E3 Business Expo even begins. By the time of the event itself, we want every business at every stand to have covered their costs and more. That means that every new contact, every new enquiry, and every new sale that results from the Expo itself comes as an added bonus. That’s an ambitious goal and not one that we’ve heard other event organisers aspire to. But we believe in changing the nature of the industry, and we know that exhibition organisers could be doing a lot more to help their exhibitors succeed. If you’d like to see just how passionately we believe this, take a look at this video. 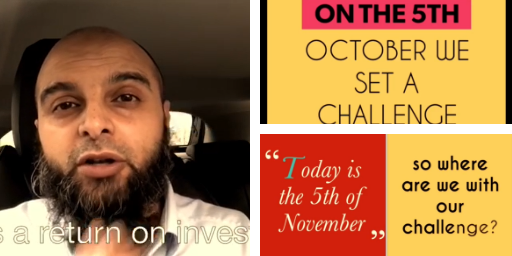 Here, 1EM managing director Mubarak Chati explains why he set himself this challenge, and why he wanted to do it in such a very public way. Of course, we’re going to need time to help every exhibitor to earn that return on investment. We reckon that we’ll need three months ahead of the Expo to work with each exhibitor, open our networks to them and make the kind of introductions that will help to build their sales. The cut-off date for that is therefore the 3rd January 2019. After that, we’ll still be taking stand bookings and we’ll still do all we can to give latecomer exhibitors a ROI ahead of the event, but we think three months is a sensible timeframe. Happily, the system is already working. By the end of September 2018 – a full six months ahead of the Expo itself – we had enabled two of our registered exhibitors to gain a clear return on investment . Now, at the end of October, that number has risen to five. In addition to offering direct one-to-one support for exhibitors, we’ll also be providing free training sessions to help them maximise their chances of success on the day of the Expo. This training is based on more than 20 years of experience in the world of exhibitions, and more than a decade in event organisation. It’s something we’ve been offering since 2016 and it has always been very well received. Now, however, in the same spirit of wanting to disrupt the sector, we’ve decided to make those lessons and that experience freely available to everyone. We’ll be doing it through a series of short (3 minute) video tutorials, which we’ll start to release in January. In the first, Mubarak will address perhaps the most fundamental question of all when it comes to exhibiting: how do you choose the right expo? This will touch on matters of research and target markets, and why it’s important to question why you want to exhibit at any given event. The videos will come with a comments feature, so please look out for them and if you have any thoughts or feedback, feel free to join in the debate.